Response to ‘15 Answers to Creationist Nonsense’ by John Rennie (Editor), Scientific American 287 (1):78–85, July 2002; Feature article on Scientific American website, 17 June 2002. 3. Evolution is unscientific, because it is not testable or falsifiable. 10. Mutations are essential to evolution theory, but mutations can only eliminate traits. Since Porter, Scientific American has had only six editors in chief, and the most recent two have diametrically opposed their founder’s original vision. Now, as will be explained further in this article, Scientific American works to push an atheistic world view in the guise of ‘science’, and a number of corollaries such as a radical pro-abortion, 1 human cloning 2 and population control agenda. 3 The previous editor, Jonathan Piel, refused to hire Forrest Mims III when Mims admitted he was a creationist, and when Piel asked Mims whether he was pro-life, Mims replied, ‘Of course—aren’t you glad your mother was?’ Piel admitted that Mims’ work was ‘fabulous’, ‘great’ and ‘first rate’, and ‘should be published somewhere’. 4 Scientific American subsequently published an article about his revolutionary atmospheric haze detector (see Revolutionary Atmospheric Invention by Victim of Anti-creationist Discrimination). Now the current editor since late 1994, one John Rennie (b. 1959), has also fervently promoted the anti-God evolution agenda. Like many anti-creationist propagandists, he often launches into attacks with a poor understanding, and he has only a bachelor’s degree in science, so is far less qualified than the leading creationist scientists at CMI and ICR. Under his editorship, an article was published in the March 2002 issue, vociferously attacking creationists and misrepresenting the Kansas curriculum controversy. 5 It illustrated the vitriol that can result when there is any attempt to mildly de-emphasize the treating of evolution from goo-to-you-via-the-zoo as fact—see What really happened in Kansas? Earlier, at the height of this controversy, Rennie himself urged scientists on university admissions committees to adopt bully-boy tactics in notifying the Kansas governor and the state board of education that ‘in light of the newly lowered education standards in Kansas, the qualifications of any students applying from that state in the future will have to be considered very carefully.’ 6 In logic, this is known as the fallacy of Argumentum ad baculum, i.e. ‘Agree with me or else unpleasant consequences will follow!’ Rennie is far from the only evolutionist to resort to this. Now Rennie has become more actively involved in the fray, taking on the role of the valiant B.S. (B.Sc.) scientist trying to stem the creationist tide. He wrote the object of this rebuttal, namely ‘15 Answers to Creationist Nonsense’, subtitled, ‘Opponents of evolution want to make a place for creationism by tearing down real science, but their arguments don’t hold up’. Even the magazine’s cover had splashed on the top, ‘15 ways to expose creationist nonsense’. But as will be shown, Rennie has only the vaguest ideas about real creationist arguments. Many of the ‘creationist arguments’ are ‘straw man’ arguments, which CMI has also rejected. But Rennie’s arguments for evolution are also nothing new, and have been mostly answered on our website. We have also pointed out many of the logical fallacies common among evolutionists, including inconsistent definitions of the word evolution— equivocation, and failing to differentiate between origins and operational science. We have also pointed out that evolutionary belief is largely a deduction from materialistic axioms, which as we will show, Rennie actually agrees with, and he lamely tries to defend this bias. Why publish on our website? while my response is non-indented and in black text. We follow Rennie’s section headings. This is true. Darwin’s main opposition came from the scientists (see Holy War? Who really opposed Darwin?) and much of his support came from compromising clergymen such as Rev. Charles Kingsley, who applied it to humans to assert that the African-Americans and Australian Aborigines had not evolved enough to understand the Gospel (see Darwin’s quisling). … but the massing evidence from paleontology, genetics, zoology, molecular biology and other fields gradually established evolution’s truth beyond reasonable doubt. This is a debate tactic known as ‘elephant hurling’. This is where the critic throws summary arguments about complex issues to give the impression of weighty evidence, but with an unstated presumption that a large complex of underlying ideas is true, and failing to consider opposing data, usually because they have uncritically accepted the arguments from their own side. But we should challenge elephant-hurlers to offer specifics and challenge the underlying assumptions. Today that battle has been won everywhere—except in the public imagination. To be honest, I think Rennie underestimates the hold of evolution on the ‘public imagination’. While many Americans say they believe in creation and reject evolution, sadly many seem to be evolutionized in their thinking. This is shown by the widespread idea that their personal faith should not influence their public life. It’s unfortunate to hear professing Christians who say that they won’t let their faith influence their public policy, e.g. ‘I’m personally opposed to abortion, but I won’t enforce my faith on the pregnant woman who must be given the right to choose’, although the unborn baby has no ‘choice’. However, atheists are very happy to let their own faith influence their public policy and enforce their views on people—we rarely hear: ‘I’m personally in favor of abortion, but I won’t enforce my view on the innocent unborn baby’. For a refutation of the related fallacy that ‘you cannot/should not legislate morality’, see Dispelling false notions of the First Amendment: The Falsity, Futility, and Folly Of Separating Morality From Law. See also The Separation of Church and Faith and Stephen Jay Gould and NOMA. That is why CMI’s primary focus is not on refuting evolution per se, but rather building a consistent Biblical Christian world view. Refuting evolution (and millions of years) is a corollary. See Design is not enough! and CMI’ views on the Intelligent Design Movement. Embarrassingly, in the 21 st century, in the most scientifically advanced nation the world has ever known, creationists can still persuade politicians, judges and ordinary citizens that evolution is a flawed, poorly supported fantasy. They lobby for creationist ideas such as ‘intelligent design’ to be taught as alternatives to evolution in science classrooms. Perhaps the USA is ‘the most scientifically advanced nation the world has ever known’ precisely because it has been the most Bible-based society the world has ever known! And that includes belief in the Biblical account of Creation, the Fall and the Flood. See The Creationist Basis for Modern Science. Note, CMI is not a lobby group, and we oppose legislation for compulsion of creation teaching. For one thing, why would we want an atheist to be forced to teach creation and, thus, give a distorted view? But we would like legal protection for teachers who present scientific arguments against the sacred cow of evolution. As this article goes to press, the Ohio Board of Education is debating whether to mandate such a change. Some antievolutionists, such as Philip E. Johnson, a law professor at the University of California at Berkeley and author of Darwin on Trial, admit that they intend for intelligent-design theory to serve as a ‘wedge’ for reopening science classrooms to discussions of God. By this ‘reasoning’, he would have to blast Rufus Porter for founding Scientific American for a similar purpose! Besieged teachers and others may increasingly find themselves on the spot to defend evolution and refute creationism. The arguments that creationists use are typically specious and based on misunderstandings of (or outright lies about) evolution, but the number and diversity of the objections can put even well-informed people at a disadvantage. Perhaps the ‘well-informed’ find the creationist arguments convincing because they recognize the validity of them? And real scientists, whom Rennie would call ‘well-informed’, actually have no use for evolution in their work! See How important is evolution to science, really?, Is evolution really necessary for medical advances? and comments by National Academy of Sciences scientist Dr Philip Skell. To help with answering them, the following list rebuts some of the most common ‘scientific’ arguments raised against evolution. It also directs readers to further sources for information and explains why creation science has no place in the classroom. Cool! We’d love Bible-believing Christians to be confronted with the weak arguments from Rennie’s article—demonstrating the fallacies will boost their confidence in witnessing! And it could help some non-Christians to see the fallacy of materialist thinking—especially as these arguments from the editor of a major science magazine are presumably the best they’ve got. CMI has also advised against using this, in this section of Arguments we think creationists should NOT use, because a ‘theory’ in science means something with a reasonable amount of support, and gives evolution more credence than it deserves. All sciences frequently rely on indirect evidence. Physicists cannot see subatomic particles directly, for instance, so they verify their existence by watching for telltale tracks that the particles leave in cloud chambers. The absence of direct observation does not make physicists’ conclusions less certain. This misses the point—these cloud chamber experiments are still observations in the present and are repeatable . A dinosaur turning into a bird 150 Ma (million years ago) is neither observable in real time, directly or indirectly, nor repeatable. Here is another argument we have previously advised creationists not to use, in this section of Arguments we think creationists should NOT use. Why should we argue this, since tautology is quite common in science, and natural selection is an important part of the Creation/Fall framework?—See Q&A: Natural selection. 3. Evolution is unscientific, because it is not testable or falsifiable. It makes claims about events that were not observed and can never be re-created. This blanket dismissal of evolution ignores important distinctions that divide the field into at least two broad areas: microevolution and macroevolution. Having said that, CMI has advised people not to use the micro-/macro-evolution distinction in this section of Arguments we think creationists should NOT use, because the main issue is not the size of the change but the direction. All observed change involves sorting and loss of genetic information, while goo-to-you evolution requires an increase in information. Microevolution looks at changes within species over time—changes that may be preludes to speciation, the origin of new species. Macroevolution studies how taxonomic groups above the level of species change. Its evidence draws frequently from the fossil record and DNA comparisons to reconstruct how various organisms may be related. But ‘evidence’ doesn’t speak for itself; it must be interpreted. As Rennie proclaims at the end, this evidence is interpreted within a materialistic framework. Then materialists turn around and proclaim evolution as a major evidence for materialism, which was responsible for it in the first place! Creationists interpret the same evidence but by a Biblical framework—see Presuppositionalism vs evidentialism. How creationists treat the fossil record is explained in the articles in the book and Q&A page (right). DNA comparisons are just a subset of the homology argument, which again also makes sense in a Biblical framework. A common designer is another interpretation that makes sense of the same data. An architect commonly uses the same building material for different buildings, and a car maker commonly uses the same parts in different cars. So we shouldn’t be surprised if a Designer for life used the same biochemistry and structures in many different creatures. Conversely, if all living organisms were totally different, this might look like there were many designers instead of one. See Common structures = common ancestry? Since DNA codes for structures and biochemical molecules, we should expect the most similar creatures to have the most similar DNA. Apes and humans are both mammals, with similar shapes, so have similar DNA. We should expect humans to have more DNA similarities with another mammal like a pig than with a reptile like a rattlesnake. And this is so. Humans are very different from yeast but they have some biochemistry in common, so we should expect human DNA to differ more from yeast DNA than from ape DNA. So the general pattern of similarities need not be explained by common-ancestry (evolution). Furthermore, there are some puzzling anomalies for an evolutionary explanation—similarities between organisms that evolutionists don’t believe are closely related. For example, hemoglobin, the complex molecule that carries oxygen in blood and results in its red color, is found in vertebrates. But it is also found in some earthworms, starfish, crustaceans, molluscs and even in some bacteria. The α-hemoglobin of crocodiles has more in common with that of chickens (17.5 %) than that of vipers (5.6 %), their fellow reptiles. 8 An antigen receptor protein has the same unusual single chain structure in camels and nurse sharks, but this cannot be explained by a common ancestor of sharks and camels. 9 And there are many other examples of similarities that cannot be due to evolution. These days even most creationists acknowledge that microevolution has been upheld by tests in the laboratory (as in studies of cells, plants and fruit flies) and in the field (as in Grant’s studies of evolving beak shapes among Galápagos finches). And why should creationists deny such things? All are part of a created and fallen world, but have never been observed to add new genetic information. And we have shown that the sorts of changes which are observed are the wrong type to drive the evolutionary story. See The Evolution Train’s A-coming. Natural selection and other mechanisms—such as chromosomal changes, symbiosis and hybridization—can drive profound changes in populations over time. Again, do these profound changes increase information? Populations are seen losing information, and adapting within the constraints of the information they already have; goo-to-you evolution requires something quite different, the progressive addition of massive amounts of genetic information that is novel to not only that population, but to the biosphere. The historical nature of macroevolutionary study involves inference from fossils and DNA rather than direct observation. Yet in the historical sciences (which include astronomy, geology and archaeology, as well as evolutionary biology), hypotheses can still be tested by checking whether they accord with physical evidence and whether they lead to verifiable predictions about future discoveries. For instance, evolution implies that between the earliest-known ancestors of humans (roughly five million years old) and the appearance of anatomically modern humans (about 100,000 years ago), one should find a succession of hominid creatures with features progressively less apelike and more modern, which is indeed what the fossil record shows. What the fossil record shows in reality, even granted the evolutionary ‘dating’ methods, is that this clear-cut progression exists only in the minds of evolutionary popularists. Marvin Lubenow, in his book Bones of Contention, shows that the various alleged ‘ape-men’ do not form a smooth sequence in evolutionary ‘ages’, but overlap considerably. For example, the time-span of Homo sapiens fossils contains the time-span of the fossils of Homo erectus, supposedly our ancestor. Also, when the various fossils are analysed in depth, they turn out not to be transitional or even mosaic. The morphology overlaps too—the Journal of Creation paper by creationist John Woodmorappe, titled The non-transitions in ‘human evolution’—on evolutionists’ terms concludes from the analysis of a number of characteristics that Homo ergaster, H. erectus, H. neanderthalensis as well as H. heidelbergensis , were most likely ‘racial’ variants of modern man, while H. habilis and another specimen called H. rudolfensis were just types of australopithecines. In fact, H. habilis is now regarded as an invalid name, probably caused by assigning fragments of australopithecines and H. erectus fossils into this ‘taxonomic wastebin’. But one should not—and does not—find modern human fossils embedded in strata from the Jurassic period (65 million years ago). Actually, evolutionists could easily accommodate such ‘out of place fossils’, as they have with living specimens of the Coelacanth fish and Wollemi Pine. These are just as sensational from an evolutionary paleontologist’s perspective as finding a living dinosaur. Since the materialistic paradigm (interpretive framework) is all important, evolutionists would be able to explain an ‘old’ human fossil by ‘reworking’ (displacing from the initial burial depth), or may even reassign such bones to another creature, since after all ‘we know’ that humans can’t be that deep in the fossil record! For example, the famous fossil footprints at Laetoli, Africa, of an upright walking biped—the University of Chicago’s Dr Russell Tuttle has shown that these are the same sorts of prints as made by habitually barefoot humans. But since they are dated at millions of years prior to when evolutionists believe modern humans arrived, they are regarded as australopithecine prints, by definition, even though australopithecine foot bones are substantially different from human ones. And then in an amazing twist, the same prints are held up as evidence that australopithecines walked upright like humans—regardless of the fact that other aspects of their anatomy indicate otherwise. Another good example of how a researcher’s presuppositions can lead to all sorts of special pleading is the explaining away of clear evidence for a fossil belemnite in Fossil flip-flop. The fossil order can be explained in a creationist framework, which avoids some of the contradictions of the evolutionary view. See Where are all the human fossils? and The Fossil Record: Becoming More Random All the Time (more technical). Evolutionary biology routinely makes predictions far more refined and precise than this, and researchers test them constantly. Evolution could be disproved in other ways, too. If we could document the spontaneous generation of just one complex life-form from inanimate matter, then at least a few creatures seen in the fossil record might have originated this way. Incidentally, it’s important to note that a non-complex life form is an impossibility, since it needs to have the ability to reproduce. Even the simplest known true self-reproducing organism, a Mycoplasma, has 482 genes with 580,000 ‘letters’ (base pairs). But even this appears not to be enough to sustain itself without parasitizing an even more complex organism. Most likely, the parasitism resulted from loss of some of the genetic information required to make some essential nutrients (see Genome decay in the Mycoplasmas). Therefore a hypothetical first cell that could sustain itself would have to be even more complex. If superintelligent aliens appeared and claimed credit for creating life on earth (or even particular species), the purely evolutionary explanation would be cast in doubt. But no one has yet produced such evidence. The Bible claims to be a revelation by the Creator of life and the Universe, who certainly has ‘claimed credit for creating life on Earth’, yet Rennie does not see this as casting doubt on evolution. And there is excellent evidence that the Bible’s claims are true (see Q&A: Bible). But Rennie has apparently already made up his mind that this evidence doesn’t exist—this would presumably upset his materialistic faith. This is simply an attempt to immunize evolution from the same criticism that’s advanced at creationists. As often pointed out, it’s hard to come up with a definition of ‘science’ that includes evolution and excludes creation unless it’s blatantly self-serving. Sometimes these definitions are self-contradictory, e.g. some, including Gould, have claimed that Creation is not scientific because it’s not testable, but then they go on to explain how it has allegedly been tested and shown to be wrong. It’s logically possible for a belief to lose adherents even if journals still publish articles supporting this belief. Rennie might benefit from some study of simple logic (my paper Logic and Creation might help). Conversely, serious scientific publications disputing evolution are all but nonexistent. In the mid-1990s George W. Gilchrist of the University of Washington surveyed thousands of journals in the primary literature, seeking articles on intelligent design or creation science. Among those hundreds of thousands of scientific reports, he found none. In the past two years, surveys done independently by Barbara Forrest of Southeastern Louisiana University and Lawrence M. Krauss of Case Western Reserve University have been similarly fruitless. But would they know what to look for? And as shown below, and above with Scientific American itself, creationists are hardly likely to want to blow their cover and risk the discrimination epitomized by Scientific American. Would Nature or Science, for example, ever knowingly publish a paper favourable to Creation? Hardly. But in spite of the bias against such publication, creationist scientists have managed to publish papers when the creationist implications are disguised subtly enough. This shows that they do carry out real scientific research. See Do Creationists Publish in Notable Refereed Journals? Creationists retort that a closed-minded scientific community rejects their evidence. An absolutely amazing comment coming from a journal that’s publicly reached the nadir of anti-creationist censorship and discrimination, as shown above! Yet according to the editors of Nature, Science and other leading journals, few antievolution manuscripts are even submitted. As shown, there is clear proof of censorship by Scientific American, Science and Australasian Science, where they have even denied creationists the normal courtesy of the right of reply. So why would scientists bother to waste their time? They know that their papers will be rejected, no matter how good the research! Which is why creationist scientists have, years ago, commenced their own peer-reviewed journals. Of course not, with the fanatical censorship. … at best, they identify certain evolutionary problems as unsolved and difficult (which no one disputes). An interesting admission, but that’s hardly the impression that evolutionists usually give to the public. In short, creationists are not giving the scientific world good reason to take them seriously. So why is Rennie taking us seriously by writing this article? But modern evolutionary theory is all about providing a plausible mechanism for explaining life’s complexity without God. If the disputes undermine favored mechanisms, then the materialist apologetic crumbles. The supporters of various evolutionary camps score mortal blows against the mechanisms proposed by rival camps, so it’s perfectly reasonable for creationists to point this out. For example, with the origin of birds, there are two main theories: that birds evolved ‘ground up’ from running dinosaurs (the cursorial theory), and that they evolved ‘trees-down’ from small reptiles (the arboreal theory). Both sides produce devastating arguments against the other side. The evidence indicates that the critics are both right—birds did not evolve either from running dinos or from tree-living mini-crocodiles. In fact, birds did not evolve from non-birds at all! Similarly, supporters of ‘jerky’ evolution (saltationism and its relative, punctuated equilibria ) point out that the fossil record does not show gradualism, and that the hypothetical transitional forms would be disadvantageous. But supporters of gradual evolution point out that large, information-increasing change is so improbable that one would need to invoke a secular miracle. Creationists agree with both: punctuational evolution can’t happen, and gradual evolution can’t happen—in fact, particles-to-people evolution can’t happen at all! Unfortunately, dishonest creationists have shown a willingness to take scientists’ comments out of context to exaggerate and distort the disagreements. Pure assertion. This ‘quoting out of context’ is a common fetish repeated by skeptics and their churchian allies. The silliest thing of all is to write to the author and ask whether he had been misquoted, which some anti-creationists actually do, as surprising as it may seem. All one needs to do to demonstrate misquoting is to compare the quote with the original. They do no such thing. Rather, they make it very clear that Gould was a staunch evolutionist, but criticised many aspects of neo-Darwinian theory. Quoting Gould was the perfectly honorable strategy of using a hostile witness. See Gould grumbles about creationist ‘hijacking’ [and his obituary written after this article]. … and they present punctuated equilibrium as though it allows new species to materialize overnight or birds to be born from reptile eggs. Easy to assert, but another thing to prove. If there is any ‘out-of-context’ quote on our website, for example, we would like to know about it, because we are not about misleading people. Where such things have very rarely occurred in our literature over the years, we have willingly corrected them. Rennie has made sweeping assertions, but without substance. This surprisingly common argument reflects several levels of ignorance about evolution. Indeed it does, which is why CMI advised against using this in this section of Arguments we think creationists should NOT use. In the paragraph quoted next, Rennie makes the same mistake as many do concerning the common ancestor, but he does realise the main problem with this argument. The first mistake is that evolution does not teach that humans descended from monkeys; it states that both have a common ancestor. Which, according to G.G. Simpson and Gould would be called an ape or a monkey by anyone who saw it, so it’s just a petty criticism of those who say this. The deeper error is that this objection is tantamount to asking, ‘If children descended from adults, why are there still adults?’ New species evolve by splintering off from established ones, when populations of organisms become isolated from the main branch of their family and acquire sufficient differences to remain forever distinct. The parent species may survive indefinitely thereafter, or it may become extinct. As Creation Ministries International pointed out! Actually, they have found out how some major building blocks CANNOT be formed, e.g. cytosine (see Origin of Life: Instability of building blocks). This is just bluff, since spontaneous polymerization is a major hurdle for non-living chemicals to overcome (see Origin of Life: The Polymerization Problem). So is producing molecules all of one handedness (see Origin of Life: The Chirality Problem), and overcoming the inherent instability of the alleged building blocks (see Origin of life: instability of building blocks). Chemical evolutionists have yet to solve these problems, let alone produce any self-replicating system which has any relevance to cells (Self-Replicating Enzymes?). … laying the foundation for cellular biochemistry. Astrochemical analyses hint that quantities of these compounds might have originated in space and fallen to earth in comets, a scenario that may solve the problem of how those constituents arose under the conditions that prevailed when our planet was young. Again, wishful thinking, partly motivated by the hopelessness of current theories about life spontaneously generating on Earth—see Sugars from space? Do they prove evolution? and Did life’s building blocks come from outer space? Creationists sometimes try to invalidate all of evolution by pointing to science’s current inability to explain the origin of life. But even if life on earth turned out to have a nonevolutionary origin (for instance, if aliens introduced the first cells billions of years ago), evolution since then would be robustly confirmed by countless microevolutionary and macroevolutionary studies. Here we go again with the bait’n’switch concerning the meanings of evolution. Anyway, that downplays the real problem. Evolution is a pseudo-intellectual justification for materialism, because it purports to explain life without God. So materialism would be in great trouble if evolution had a problem right at the start (‘chemical evolution’). After all, if the process can’t even start, it can’t continue. Chance plays a part in evolution (for example, in the random mutations that can give rise to new traits), but evolution does not depend on chance to create organisms, proteins or other entities. Quite the opposite: natural selection, the principal known mechanism of evolution, harnesses nonrandom change by preserving ‘desirable’ (adaptive) features and eliminating ‘undesirable’ (nonadaptive) ones. But the raw material on which natural selection acts is random copying errors (mutations). If evolution from goo to you were true, we should expect to find countless information-adding mutations. But we have not even found one indisputable example. As long as the forces of selection stay constant, natural selection can push evolution in one direction and produce sophisticated structures in surprisingly short times. An example would have been nice. As an analogy, consider the 13-letter sequence ‘TOBEORNOTTOBE.’ Those hypothetical million monkeys, each pecking out one phrase a second, could take as long as 78,800 years to find it among the 26 13 sequences of that length. But in the 1980s Richard Hardison of Glendale College wrote a computer program that generated phrases randomly while preserving the positions of individual letters that happened to be correctly placed (in effect, selecting for phrases more like Hamlet’s). On average, the program re-created the phrase in just 336 iterations, less than 90 seconds. Even more amazing, it could reconstruct Shakespeare’s entire play in just four and a half days. These computer programs have been widely popularized by the atheist Richard Dawkins, but are a lot of bluff. Such simulations as Dawkins, and now Rennie, propose as ‘simulations’ of evolution work towards a known goal, so are far from a parallel to real evolution, which has no foresight, hence a ‘Blind Watchmaker’. The simulations also use ‘organisms’ with high reproductive rates (producing many offspring), high mutation rates, a large probability of a beneficial mutation, and a selection coefficient of 1 (perfect selection) instead of 0.01 (or less) which parallels real life more accurately. The ‘organisms’ have tiny ‘genomes’ with minute information content, so are less prone to error catastrophe, and they are not affected by the chemical and thermodynamic constraints of a real organism. For more information, see this refutation of Dawkins’ book Climbing Mt Improbable, Weasel Words and Dawkins’ weasel revisited. Also, in TJ(16(2)), we published an article about a more realistic computer simulation, Weasel, a flexible program for investigating deterministic computer ‘demonstrations’ of evolution, and the program can be downloaded here. This shows that the goal is NOT reached if realistic values are programmed, or it takes so long that it shows that evolution is impossible. For a refutation of the whole idea of computer simulations of evolution, particularly in the guise of genetic algorithms, see Genetic algorithms—do they show that evolution works?—all these problems also apply to the simplistic ‘simulation’ Rennie writes about. Also, when it comes to the origin of first life, natural selection cannot be invoked, because this requires a self-reproducing entity. Therefore chance alone must produce the precise sequences needed, so these simulations do not apply (see Q&A: Probability). And a further problem with the alleged chemical soup is reversibility, intensifying the difficulty of obtaining the right sequence by chance—see Could Monkeys Type the 23 rd Psalm. This argument derives from a misunderstanding of the Second Law. It would be most surprising, in our experience, if an anti-creationist lacking training in physics or chemistry understood the Second Law himself. As will be shown, biologist Rennie is no exception. I should say that Rennie’s formulation of the creationist argument is not how informed creationists would argue—see Q&A: Thermodynamics. If it were valid, mineral crystals and snowflakes would also be impossible, because they, too, are complex structures that form spontaneously from disordered parts. No, as usual, this anti-creationist confuses order (repetitive, low information) with complexity (non-repetitive, high information). See this answer to another anti-creationist science writer who made the same mistake. It’s more usual for those qualified in physical chemistry to refer to this as an isolated system , and use the term closed system for one where energy but not matter can be exchanged with its surroundings. … cannot decrease. Entropy is a physical concept often casually described as disorder, but it differs significantly from the conversational use of the word. We totally agree, and point this out often. More important, however, the Second Law permits parts of a system to decrease in entropy as long as other parts experience an offsetting increase. Thus, our planet as a whole can grow more complex because the sun pours heat and light onto it, and the greater entropy associated with the sun’s nuclear fusion more than rebalances the scales. Simple organisms can fuel their rise toward complexity by consuming other forms of life and nonliving materials. This energy input is necessary but not sufficient. The proverbial bull in a china shop produces disorder, but if the same bull were harnessed to a generator, this energy could be directed into useful work. Similarly, living organisms have machinery to direct the energy from sunlight or food, including the ATP synthase motor. But machinery presupposes teleology (purpose), which means that the machinery must have had an intelligent source. On the contrary, biology has catalogued many traits produced by point mutations (changes at precise positions in an organism’s DNA)—bacterial resistance to antibiotics, for example. This is a serious mis-statement of the creationist argument. The issue is not new traits, but new genetic information. In no known case is antibiotic resistance the result of new information. There are several ways where an information loss can confer resistance—see Anthrax and antibiotics: Is evolution relevant? We have pointed out in various ways how new traits, even helpful, adaptive traits, can arise through loss of genetic information (which is to be expected from mutations). See for example, Beetle bloopers. Mutations that arise in the homeobox ( Hox ) family of development-regulating genes in animals can also have complex effects. Hox genes direct where legs, wings, antennae and body segments should grow. In fruit flies, for instance, the mutation called Antennapedia causes legs to sprout where antennae should grow. Once again, there is no new information! Rather, a mutation in the hox gene results in already-existing information being switched on in the wrong place. See also Hox (homeobox) Genes — Evolution’s Saviour? and Hox Hype — Has Macro-evolution Been Proven? The hox gene did not produce any of the information that results in the complex structure of the leg, which in ants and bees includes a very complex mechanical and hydraulic structure by which these insects stick to surfaces—see Startling stickiness. These abnormal limbs are not functional, but their existence demonstrates that genetic mistakes can produce complex structures, which natural selection can then test for possible uses. Amazing—natural selection can test for ‘possible uses’ of ‘non-functional’ (i.e. useless !) limbs in the wrong place. Such deformities would be active hindrances to survival. Moreover, molecular biology has discovered mechanisms for genetic change that go beyond point mutations, and these expand the ways in which new traits can appear. Functional modules within genes can be spliced together in novel ways. Whole genes can be accidentally duplicated in an organism’s DNA, and the duplicates are free to mutate into genes for new, complex features. Gene duplication, polyploidy, insertions, etc. do not help — they represent an increase in amount of DNA, but not an increase in the amount of functional genetic information —these create nothing new. Macroevolution needs new genes (for making feathers on reptiles, for example). Duplication of a single chromosome is normally harmful, as in Down’s Syndrome. Insertions are a very efficient way of completely destroying the functionality of existing genes. Biophysicist Dr Lee Spetner in his book Not By Chance analyses examples of mutational changes that evolutionists have claimed to have been increases in information, and shows that they are actually examples of loss of specificity , which means they involved loss of information (which is to be expected from information theory). The gene duplication idea is that an existing gene may be doubled, and one copy does its normal work while the other copy is redundant and non-expressed. Therefore it is free to mutate free of selection pressure (to get rid of it). However, such ‘neutral’ mutations are powerless to produce new genuine information. Dawkins et al. point out that natural selection is the only possible naturalistic explanation for the immense design in nature (not a good one, as Spetner et al. have shown). The proposal is that random changes produce a new function, then this redundant gene becomes expressed somehow, thus comes under the selective process and is tuned. It’s all a lot of hand-waving. It relies on a chance copying event, genes somehow being switched off, randomly mutated to something approximating a new function, then being switched on again so natural selection can tune it. Furthermore, mutations do not just occur in the duplicated gene; they occur throughout the genome. Consequently, all the deleterious mutations have to be eliminated by the death of the unfit. Mutations in the target duplicate gene are extremely rare—it might represent only 1 part in 30,000 of the genome of an animal. The larger the genome the bigger the problem. This is because a larger the genome, the lower the mutation rate that can be sustained without error catastrophe, which means one has to wait longer for any mutation, let alone a desirable one, in the duplicated gene. There just has not been enough time for such a naturalistic process to account for the amount of genetic information that we see in living things. Dawkins and others have recognised that the ‘information space’ possible within just one gene is so huge that random changes without some guiding force could never come up with a new function. There could never be enough experiments (mutating generations of organisms) to find anything useful by such a process. Note that an average gene of 1,000 base pairs represents 4 1000 possibilities — that is 10 602 (compare this with the number of atoms in the universe estimated at ‘only’ 10 80 ). If every atom in the universe were an experiment every millisecond for the supposed 15 billion years of the universe, this could only try a maximum 10 100 of the possibilities. So such a ‘neutral’ process cannot find any sequence with specificity (usefulness), even allowing for the fact that there may be more than just one sequence that is functional to some extent. So Dawkins and company have the same problem as the neutral selection theory advocates. Increasing knowledge of the molecular basis of biological functions has exploded the known ‘information space’ such that mutations and natural selection, with or without gene duplication, or any other known natural process, cannot account for the irreducibly complex nature of living systems. Comparisons of the DNA from a wide variety of organisms indicate that this is how the globin family of blood proteins evolved over millions of years. This is an inference from similarities interpreted under the materialistic paradigm. There is no actual demonstration that hemoglobin (with four polypeptides) evolved from myoglobin (with one polypeptide), or any adequate explanation of how the hypothetical intermediates would have had selective advantages. In fact, it’s far more complicated than Rennie implies. The α- and β-globin chains are encoded on genes on different chromosomes, so they are expressed independently. This expression must be controlled precisely, otherwise various types of a disease called thallassemia results. Also, there is an essential protein called AHSP (Alpha Hemoglobin Stabilizing Protein) which, as the name implies, stabilizes the α-chains, and also brings it to the β-chains. Otherwise the α-chains would precipitate and damage the red blood cells. AHSP is one of many examples of a class of protein called chaperones which govern the folding of other proteins.12 This is yet another problem for chemical evolutionary theories—how did the first proteins fold correctly without chaperones, and since the chaperones themselves are complex proteins, how did they fold? See The Origin of Life: A Critique of Current Scientific Models and this . A straw man, because creationists accept new species arising within the kind, since reproductive isolation can be the result of information loss. See What is the Biblical creationist model? for more discussion on kinds and speciation. Indeed, creationists point out that the allopatric model would explain the origin of the different people groups (‘races’) when the confusion of languages at Babel induced a separation of small population groups which spread out all over the Earth. See How could all the races come from Noah and his family? and One Human Family (right). Of course, the different people groups are NOT reproductively isolated and are still a single biological species. Creationists also point out that the montane (mountainous) topography of the Ark’s landing place would also be ideal for geographical isolation. This would allow much post-Flood diversification from comparatively few (~8,000) kinds of land vertebrates, by splitting up the original high genetic variety. Note that the reproductive isolation is an informationally negative change, even if beneficial, because it blocks the interchange of genetic information between populations. Yes, it is the best studied, but these studies show that it has nothing to do with evolution of more complex life forms! All we observe it doing is removing information, not adding it. … but biologists are open to other possibilities as well. Biologists are constantly assessing the potential of unusual genetic mechanisms for causing speciation or for producing complex features in organisms. Lynn Margulis of the University of Massachusetts at Amherst and others have persuasively argued that some cellular organelles, such as the energy-generating mitochondria, evolved through the symbiotic merger of ancient organisms. But this endosymbiosis theory has many problems, e.g. the lack of evidence that prokaryotes are capable of ingesting another cell and keeping it alive, and the large differences in genes between mitochondria and prokaryotes. See Did cells acquire organelles such as mitochondria by gobbling up other cells? Thus, science welcomes the possibility of evolution resulting from forces beyond natural selection. Yet those forces must be natural; they cannot be attributed to the actions of mysterious creative intelligences whose existence, in scientific terms, is unproved. Mainly because evolutionists reject the possibility of proof of the supernatural a priori —see these admissions from evolutionists Lewontin and Todd, and in effect regard evolution as a religion as Ruse admitted. Speciation is probably fairly rare and in many cases might take centuries. But it need not. In fact, speciation can happen much faster than most evolutionists (and day-age advocates) realize. But creationists following the Biblical Creation-Fall-Flood-Migration model would expect such rapid non-evolutive speciation—see Speedy species surprise. One example is a new species of mosquitoes, i.e. one that can’t interbreed with the parent population, arising in the London Underground train system (the ‘Tube’) in only 100 years. The rapid change ‘astonished’ evolutionists, but should delight creationists—see Brisk Biters. Furthermore, recognizing a new species during a formative stage can be difficult, because biologists sometimes disagree about how best to define a species. The most widely used definition, Mayr’s Biological Species Concept, recognizes a species as a distinct community of reproductively isolated populations—sets of organisms that normally do not or cannot breed outside their community. In practice, this standard can be difficult to apply to organisms isolated by distance or terrain or to plants (and, of course, fossils do not breed). Biologists therefore usually use organisms’ physical and behavioral traits as clues to their species membership. We agree. It’s important to note this difficulty in defining ‘species’ whenever evolutionists claim that creationists don’t have a consistent definition of ‘kinds’ (which we do as discussed before). Nevertheless, the scientific literature does contain reports of apparent speciation events in plants, insects and worms. In most of these experiments, researchers subjected organisms to various types of selection—for anatomical differences, mating behaviors, habitat preferences and other traits—and found that they had created populations of organisms that did not breed with outsiders. For example, William R. Rice of the University of New Mexico and George W. Salt of the University of California at Davis demonstrated that if they sorted a group of fruit flies by their preference for certain environments and bred those flies separately over 35 generations, the resulting flies would refuse to breed with those from a very different environment. None of this is news to informed creationists. Once again, there is no new information, but sorting and loss of already existing information. Actually, paleontologists know of many detailed examples of fossils intermediate in form between various taxonomic groups. But modern evolutionists, including Gould, assert that there are nevertheless some transitional forms, but they always seem to name the same handful of disputable ones, instead of the many that Darwin hoped for. It’s the same with Rennie below. 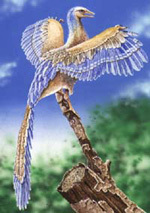 The fossil bird known as Archaeopteryx (ark-ee-OP-ter-ix), is among the most prized relics in the world (above: Legitimate artist’s impression of Archaeopteryx, by Steve Cardno; cf. 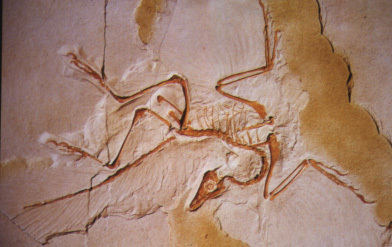 fossil of Archaeopteryx). One of the most famous fossils of all time is Archaeopteryx, which combines feathers and skeletal structures peculiar to birds with features of dinosaurs. A flock’s worth of other feathered fossil species, some more avian and some less, has also been found. More elephant-hurling without examples. But our website has documented that two famous alleged feathered dinosaurs are ‘dated’ younger than their supposed descendant Archaeopteryx and more likely to be flightless birds (Protarchaeopteryx and Caudipteryx), and one famous example, Archaeoraptor, was a fake. A sequence of fossils spans the evolution of modern horses from the tiny Eohippus. Again, this doesn’t hold up. Even informed evolutionists regard horse evolution as a bush rather than a sequence. But the so-called Eohippus is properly called Hyracotherium , and has little that could connect it with horses at all. The other animals in the ‘sequence’ actually show hardly any more variation between them than that within horses today. One non-horse and many varieties of the true horse kind does not a sequence make. See The Non-evolution of the horse. Whales had four-legged ancestors that walked on land, and creatures known as Ambulocetus and Rodhocetus helped to make that transition [see ‘The Mammals That Conquered the Seas,’ by Kate Wong; Scientific American, May]. Fossil seashells trace the evolution of various mollusks through millions of years. Perhaps 20 or more hominids (not all of them our ancestors) fill the gap between Lucy the australopithecine and modern humans. First, this is covered earlier. Second, how could these alleged ‘20 or more hominids’ fill the gap if they are ‘not all our ancestors’? That is, they are out of the gap and into a side alley. Creationists, though, dismiss these fossil studies. They argue that Archaeopteryx is not a missing link between reptiles and birds—it is just an extinct bird with reptilian features. They want evolutionists to produce a weird, chimeric monster that cannot be classified as belonging to any known group. Actually, as stated, of the few transitional forms usually touted, most are actually chimeras. No, creationists have long simply requested a sequence of creatures with certain characteristics consistently following a series, e.g. 100% leg/0% wing → 90% leg/10% wing → … → 50%leg/50% wing → … → 10% leg/90% wing → 0%leg/100% wing. Even if a creationist does accept a fossil as transitional between two species, he or she may then insist on seeing other fossils intermediate between it and the first two. These frustrating requests can proceed ad infinitum and place an unreasonable burden on the always incomplete fossil record. Nevertheless, evolutionists can cite further supportive evidence from molecular biology. All organisms share most of the same genes, but as evolution predicts, the structures of these genes and their products diverge among species, in keeping with their evolutionary relationships. Geneticists speak of the ‘molecular clock’ that records the passage of time. These molecular data also show how various organisms are transitional within evolution. Actually, despite the cute diagram in the article, the molecular clock has many problems for the evolutionist. Not only are there the anomalies and common designer arguments I mentioned above, but they actually support a creation of distinct types within ordered groups, not continuous evolution, as non-creationist microbiologist Dr Michael Denton pointed out in Evolution: A Theory in Crisis ). For example, when comparing the amino acid sequence of cytochrome C of a bacterium (a prokaryote) with such widely diverse eukaryotes as yeast, wheat, silkmoth, pigeon and horse, all of these have practically the same percentage difference with the bacterium (64–69%). There is no intermediate cytochrome between prokaryotes and eukaryotes, and no hint that the ‘higher’ organism such as a horse has diverged more than the ‘lower’ organism such as the yeast. The same sort of pattern is observed when comparing cytochrome C of the invertebrate silkmoth with the vertebrates lamprey, carp, turtle, pigeon and horse. All the vertebrates are equally divergent from the silkmoth (27–30%). Yet again, comparing globins of a lamprey (a ‘primitive’ cyclostome or jawless fish) with a carp, frog, chicken, kangaroo and human, they are all about equidistant (73–81%). Cytochrome C’s compared between a carp and a bullfrog, turtle, chicken, rabbit and horse yield a constant difference of 13–14%. There is no trace of any transitional series of cyclostome → fish → amphibian → reptile → mammal or bird. Another problem for evolutionists is how the molecular clock could have ticked so evenly in any given protein in so many different organisms (despite some anomalies discussed earlier which present even more problems). For this to work, there must be a constant mutation rate per unit time over most types of organism. But observations show that there is a constant mutation rate per generation, so it should be much faster for organisms with a fast generation time such as bacteria, and much slower for elephants. In insects, generation times range from weeks in flies to many years in cicadas and yet there is no evidence that flies are more diverged than cicadas. So evidence is against the theory that the observed patterns are due to mutations accumulating over time as life evolved. 14. Living things have fantastically intricate features— at the anatomical, cellular and molecular levels—that could not function if they were any less complex or sophisticated. The only prudent conclusion is that they are the products of intelligent design, not evolution. This ‘argument from design’ is the backbone of most recent attacks on evolution, but it is also one of the oldest. In 1802 theologian William Paley wrote that if one finds a pocket watch in a field, the most reasonable conclusion is that someone dropped it, not that natural forces created it there. By analogy, Paley argued, the complex structures of living things must be the handiwork of direct, divine invention. Darwin wrote On the Origin of Species as an answer to Paley: he explained how natural forces of selection, acting on inherited features, could gradually shape the evolution of ornate organic structures. Indeed, Gould agreed that Darwin was writing to counter Paley. This is another way of saying that he had an anti-theistic agenda—see Darwin’s real message: Have you missed it? and my review of The Essence of Darwinism. This doesn’t stop many Churchian allies ‘tugging the forelock’ at every pronouncement made by him and his God-hating successors, who in return regard them as contemptuously as Lenin regarded his ‘useful idiot’ allies in the West. Generations of creationists have tried to counter Darwin by citing the example of the eye as a structure that could not have evolved. The eye’s ability to provide vision depends on the perfect arrangement of its parts, these critics say. Natural selection could thus never favor the transitional forms needed during the eye’s evolution—what good is half an eye? Anticipating this criticism, Darwin suggested that even ‘incomplete’ eyes might confer benefits (such as helping creatures orient toward light) and thereby survive for further evolutionary refinement. First, this overlooks the incredible complexity of even the simplest light sensitive spot. Second, it’s fallacious to argue that 51% vision would necessarily have a strong enough selective advantage over 50% to overcome the effects of genetic drift’s tendency to eliminate even beneficial mutations—see the discussion in Eye Evolution: a case study. Rennie contradicts himself here. If the evolutionary history of eyes has been tracked though comparative genetics how is it that eyes have supposedly evolved independently? Actually, evolutionists recognize that eyes must have arisen independently at least 30 times because there is no evolutionary pattern to explain the origin of eyes from a common ancestor. What this really means is that since eyes cannot be related by common ancestor, then since they are here, and only materialistic explanations are allowed, hey presto, there’s proof that they evolved independently! 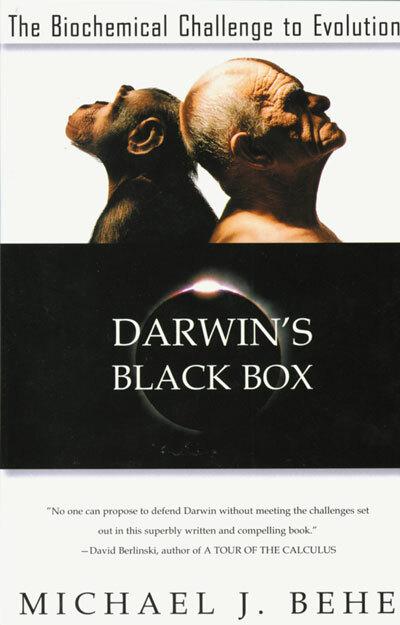 ‘Irreducible complexity’ is the battle cry of Michael J. Behe of Lehigh University, author of Darwin’s Black Box: The Biochemical Challenge to Evolution. As a household example of irreducible complexity, Behe chooses the mousetrap—a machine that could not function if any of its pieces were missing and whose pieces have no value except as parts of the whole. Hard-wired signal transduction system with short-term memory. What is true of the mousetrap, he says, is even truer of the bacterial flagellum, a whiplike cellular organelle used for propulsion that operates like an outboard motor. The proteins that make up a flagellum are uncannily arranged into motor components, a universal joint and other structures like those that a human engineer might specify. The possibility that this intricate array could have arisen through evolutionary modification is virtually nil, Behe argues, and that bespeaks intelligent design. Indeed, it does (see diagram, right). He makes similar points about the blood’s clotting mechanism and other molecular systems. Yet evolutionary biologists have answers to these objections. First, there exist flagellae with forms simpler than the one that Behe cites, so it is not necessary for all those components to be present for a flagellum to work. The sophisticated components of this flagellum all have precedents elsewhere in nature, as described by Kenneth R. Miller of Brown University and others. Miller is hardly the epitome of reliability, as shown by the review by John Woodmorappe and myself of his book Finding Darwin’s God. Behe has also responded to critics such as Miller on this site. In fact, the entire flagellum assembly is extremely similar to an organelle that Yersinia pestis, the bubonic plague bacterium, uses to inject toxins into cells. This actually comes from the NCSE’s misuses of the research of Dr Scott Minnich, a geneticist and Associate Professor of Microbiology at the University of Idaho. He is a world-class expert on the flagellum who says that belief in design has given him many research insights. His research shows that the flagellum won’t form above 37°C, and instead some secretory organelles form from the same set of genes. 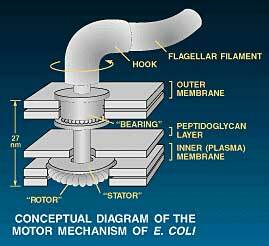 But this secretory apparatus, as well as the plague bacterium’s drilling apparatus, are a degeneration from the flagellum, which Minnich says came first although it is more complex (see Bacterial Flagella: Spinning Tails of Complexity and Co-Option). The key is that the flagellum’s component structures, which Behe suggests have no value apart from their role in propulsion, can serve multiple functions that would have helped favor their evolution. Actually, what Behe says he means by irreducible complexity is that the flagellum could not work without about 40 protein components all organized in the right way. Rennie’s argument is like claiming that if the components of an electric motor already exist in an electrical shop, they could assemble by themselves into a working motor. However, the right organisation is just as important as the right components. The final evolution of the flagellum might then have involved only the novel recombination of sophisticated parts that initially evolved for other purposes. Similarly, the blood-clotting system seems to involve the modification and elaboration of proteins that were originally used in digestion, according to studies by Russell F. Doolittle of the University of California at San Diego. So some of the complexity that Behe calls proof of intelligent design is not irreducible at all. This is once more a lot of bluff by the atheist Doolittle, or at least poor reading comprehension. He cited recent experiments showing that mice could survive with two of the components of the blood clotting cascade (plasminogen and fibrinogen) eliminated. This supposedly showed that the current cascade was not irreducibly complex but clearly reducibly complex. But the experiment really showed that the mice lacking both components were better off than one lacking only plasminogen, because the latter suffer from uncleared clots. But the former are hardly as healthy as Doolittle implied, because the only reason they don’t suffer from uncleared clots is that they have no functional clotting system at all! A non-functioning clotting system (despite possessing all the many remaining components) is hardly an evolutionary intermediate that natural selection could refine to produce a proper clotting system. Rather, this experiment is evidence against this, because the next step (i.e. from lacking both plasminogen and fibrinogen to fibrinogen only) would be selected against because of the uncleared clots. For more information, see Behe’s In Defense of the Irreducibility of the Blood Clotting Cascade. Complexity of a different kind—‘specified complexity’—is the cornerstone of the intelligent-design arguments of William A. Dembski of Baylor University in his books The Design Inference and No Free Lunch. Essentially his argument is that living things are complex in a way that undirected, random processes could never produce. The only logical conclusion, Dembski asserts, in an echo of Paley 200 years ago, is that some superhuman intelligence created and shaped life. Dembski’s argument contains several holes. It is wrong to insinuate that the field of explanations consists only of random processes or designing intelligences. Researchers into nonlinear systems and cellular automata at the Santa Fe Institute and elsewhere have demonstrated that simple, undirected processes can yield extraordinarily complex patterns. Some of the complexity seen in organisms may therefore emerge through natural phenomena that we as yet barely understand. But that is far different from saying that the complexity could not have arisen naturally. Talk about blind faith! But in practice, as Dembski points out, specified complexity in all cases but biology is used as evidence of design, including the SETI project. Since biological complexity is the only exception proposed by evolutionists, it smacks of special pleading. See Information: A modern scientific design argument. ‘Creation science’ is a contradiction in terms. A central tenet of modern science is methodological naturalism—it seeks to explain the universe purely in terms of observed or testable natural mechanisms. Now we get to the key issue. It’s not about scientific facts at all, but self-serving materialistic Rules of the Game by which the facts are interpreted by the evolutionary establishment. So it should be instructive for people to understand what’s really driving Rennie and his ilk—a materialist or naturalist agenda. This is not a tenet deducible by the experimental method, but a philosophical assumption from outside science. This conveniently ignores the creationist contributions to the founding of science and the presuppositions needed for science to work. Thus, physics describes the atomic nucleus with specific concepts governing matter and energy, and it tests those descriptions experimentally. Physicists introduce new particles, such as quarks, to flesh out their theories only when data show that the previous descriptions cannot adequately explain observed phenomena. The new particles do not have arbitrary properties, moreover—their definitions are tightly constrained, because the new particles must fit within the existing framework of physics. What has this to do with evolution? As I’ve mentioned, creationists agree that the particles would not behave arbitrarily, because they were created by a God of order. But an atheist has no philosophical justification from his underlying religious premise, i.e. ‘God does not exist’, for a belief in an orderly universe. Intelligent design offers few answers. For instance, when and how did a designing intelligence intervene in life’s history? By creating the first DNA? The first cell? The first human? Was every species designed, or just a few early ones? Proponents of intelligent-design theory frequently decline to be pinned down on these points. They do not even make real attempts to reconcile their disparate ideas about intelligent design. We don’t speak for all advocates of intelligent design. For instance, we don’t advocate just any ‘designer’ who may or may not be capricious. Rather, we identify the Designer with the faithful Triune God of the Bible. So we base our science on the Biblical framework of history, which provides much information about when and how the Designer performed special acts of design. That is, during Creation Week about 6,000 years ago, He created distinct kinds of creatures. Shortly after that, Adam sinned and brought death and mutations into the world. About 1,500 years later, God judged the world by a global Flood that produced most of the world’s fossils. But two of every kind of land vertebrate (seven of the few ‘clean’ ones and birds) were rescued on an ocean-liner–sized Ark. After they landed on the mountains of Ararat, the Ark animals migrated and diversified, adapting to different environments—including some speciation events. Mankind disobeyed God’s command to fill the Earth, and migrated only when God confused the languages at Babel about 100 years later. This is why human fossils are higher in the post-Flood fossil record than other mammals. Instead they pursue argument by exclusion—that is, they belittle evolutionary explanations as far-fetched or incomplete and then imply that only design-based alternatives remain. Logically, this is misleading: even if one naturalistic explanation is flawed, it does not mean that all are. Actually, the arguments are based on analogy, a common scientific procedure, about what we can observe being produced by intelligent and unintelligent causes. Moreover, it does not make one intelligent-design theory more reasonable than another. Listeners are essentially left to fill in the blanks for themselves, and some will undoubtedly do so by substituting their religious beliefs for scientific ideas. But Rennie has no objection to substituting (and confusing) his own atheistic religious ideas for scientific ones! Time and again, science has shown that methodological naturalism can push back ignorance, finding increasingly detailed and informative answers to mysteries that once seemed impenetrable: the nature of light, the causes of disease, how the brain works. Evolution is doing the same with the riddle of how the living world took shape. Again, all Rennie’s examples are in the field of real operational science, but evolution is a question of origins science which is really about history. It’s also notable that creationists made precisely the advances Rennie mentions! Isaac Newton discovered the spectrum of light, Michael Faraday discovered electromagnetism, which led the way for the prediction of electromagnetic radiation; Louis Pasteur formulated the germ theory of disease and disproved spontaneous generation, Joseph Lister pioneered antiseptic surgery; Raymond Damadian pioneered magnetic resonance imaging (MRI) that is a vital tool in brain research. Creationism, by any name, adds nothing of intellectual value to the effort. Again, an assertion, in a willing ignorance concerning the contributions made by creationists to the major branches of modern science in general (see our Creationist Scientists page), and to his own magazine in particular. Even this further list of resources adds nothing to his specious arguments. Many of them have been addressed on our website. 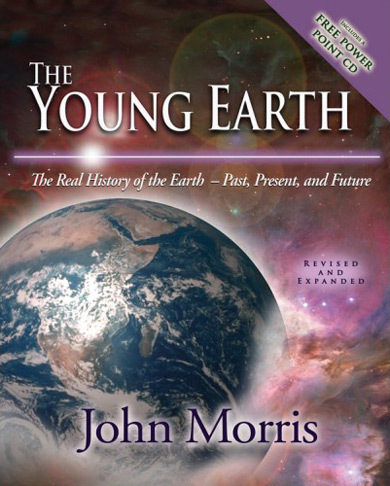 For example, Rennie recommends The Triumph of Evolution and the Failure of Creationism by Niles Eldredge, but this was convincingly refuted by John Woodmorappe. He also recommends the website for the PBS Evolution series, but CMI has produced detailed rebuttals (see Creation CD-ROM, right). 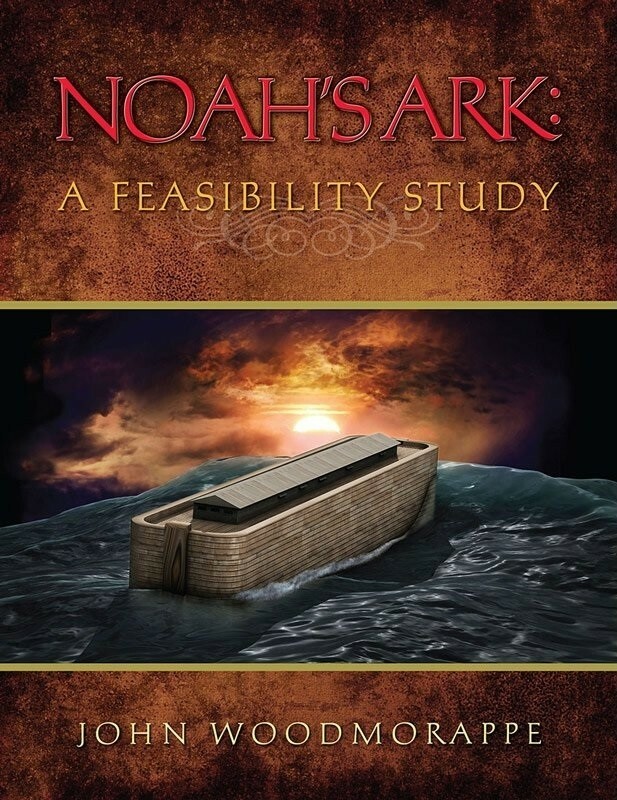 There is a second work by Robert Pennock, but as shown in this review of his first anti-creationist foray, Pennock has a history of straw-man and fallacious arguments. Evidently the evolutionists fear the increasing spread of creationist information, despite their best efforts at censorship. So they are desperate to counteract this information. But their efforts don’t withstand scientific scrutiny, and in the end evolution is admitted to be a deduction from a materialistic belief system. It is philosophy/religion dressed up as ‘science’. Holloway, M., Aborted thinking: Re-enacting the global gag rule threatens public health, Scientific American 284 (4):9–10, April 2001. Return to text. Cibelli, J., Lanza, R. and West, M., The first human cloned embryo, Scientific American 286 (1):42–49, January 2002. Return to text. Potts, M., The unmet need for family planning, Scientific American 282 (1):70–75, January 2000. Return to text. ‘Science’s Litmus Test’ (telephone transcript of conversation between Forrest Mims and Jonathan Piel, then Editor of Scientific American ), Harper’s Magazine March 1991. The transcript makes it clear that an outstanding writer was not hired for disbelieving in the sacred cow of evolution (and a ‘woman’s right to choose’ [to kill her unborn]). Return to text. Doyle, R., ‘Down with evolution!’—creationists are changing state educational standards, Scientific American 286 (3):30, March 2002. Return to text. Cited in: Johnson, P., The Wedge of Truth: Splitting the Foundations of Naturalism , p. 80, InterVarsity Press, Illinois, 2000. Return to text. Scott, E., 1997. Dealing with anti-evolutionism. Reports of the National Center for Science Education, 17 (4):24–28. Quote on p. 26, with emphasis in original. Return to text. Morris, H. and Parker, G., What is Creation Science? Master Books, 1987, pp. 52–61. See also Denton, M., Evolution: A Theory in Crisis, Adler and Adler, Maryland, 1986, chapters 7, 12. Return to text. Proceedings of the National Academy of Sciences 95 :11,804; cited in New Scientist 160 (2154):23, 3 October 1998. Return to text. Barnett, A., The second coming. Did life evolve on Earth more than once? New Scientist 157 (2121):19, 1998. Return to text. Gould, S.J., The return of hopeful monsters, Natural History 86 (6):22–30, 1977. Return to text. Kihm, A. et al., An abundant erythroid protein that stabilizes free α-haemoglobin, Nature 417 (6890):758–763, 13 June 2002; comment by Luzzatto, L. and Notaro, R., Haemoglobin’s chaperone, same issue, pp. 703–705. Return to text. Darwin, C., Origin of Species, 6th ed. 1872, reprinted 1902, John Murray, London, p. 413. Return to text. Gould, S.J., Evolution’s erratic pace, Natural History 86 (5):14, 1977. Return to text. Cited in Morell, V., Archaeopteryx : Early Bird Catches a Can of Worms, Science 259 (5096):764–65, 5 February, 1993. Return to text. Feduccia, A., Evidence from claw geometry indicating arboreal habits of Archaeopteryx , Science 259 (5096):790–793, 5 February, 1993. Return to text. Christiansen, P. and Bonde, N., Axial and appendicular pneumaticity in Archaeopteryx , Proceedings of the Royal Society of London , Series B. 267: 2501–2505, 2000. Return to text. Woodmorappe, J. Walking whales, nested hierarchies and chimeras: Do they exist? Journal of Creation 16(1):111–119, 2002. Return to text. Machalski, M., Oyster life positions and shell beds from the Upper Jurassic of Poland, Acta palaeontologica Polonica 43 (4):609–634, 1998. Abstract downloaded from , 16 June 2002. Return to text. Ager, D., The nature of the fossil record, Proceedings of the Geologists’ Association 87 (2):131–160, 1976. Return to text. See also Catchpoole, D., Evolution’s oyster twist, Creation 24 (2):55, March–May 2002. Return to text. Woodmorappe, J., Does a ‘transitional form’ replace one gap with two gaps? Journal of Creation 16(2):5–6, 2000. Return to text.